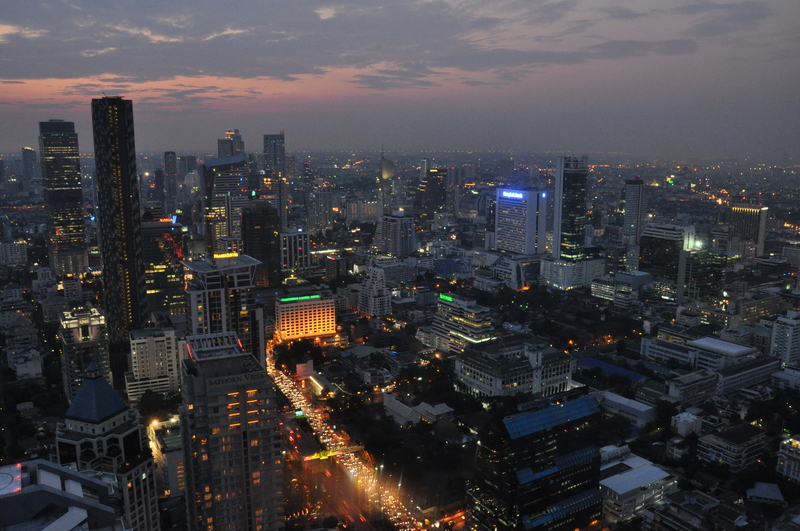 As Bangkok is one of Asia’s main hubs, we have been there several times during our trip to Asia. The 15th of December, after travelling from Ko Phi Phi by night train, we visited Bangkok during the day before taking the night train again to Chiang Mai. To be honest, the first time in Bangkok we felt quite overwhelmed because of the size of the city, but also because of the heat, which made sightseeing quite strenuous. Besides, we were quite sceptical since during our first visit to the city, a woman tried to rip us off at the Hualampong station (the main train station in Bangkok). Be careful with the women from the “official tourist information office”, they all want to bring you to their agencies! We spent our first full day in Bangkok sending the first of several packages home (by the way, Bangkok is definitely the cheapest and most reliable place to send a package in the whole Asia), visiting Chinatown from the public bus (the thing that most impressed us from Bangkok’s Chinatown was amount of jewellery shops, all full of Chinese people buying gold! 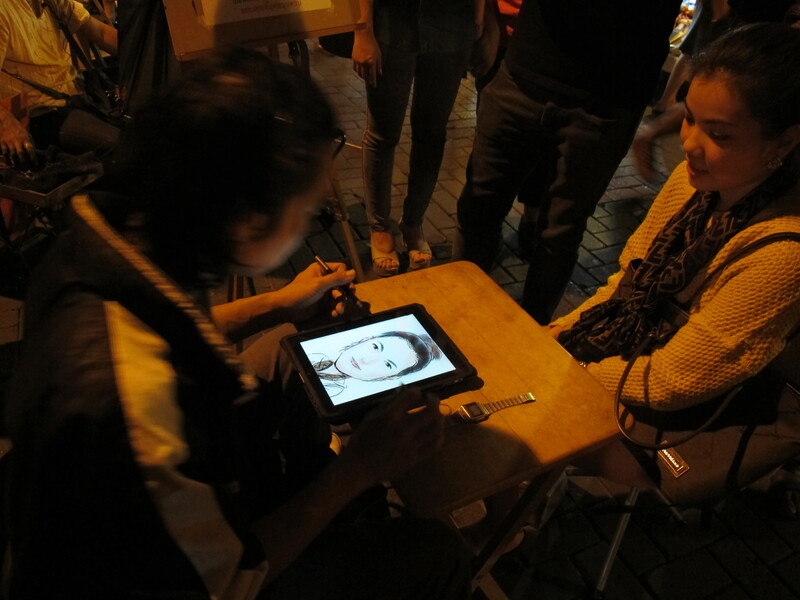 ), and the area of Khao San Road and Bangkok’s old town. We had a good lunch at a local restaurant in Khao San Road, including some delicious Thai smoothies and after lunch, while Iván walked around and looked at the shops, I went to the hair dresser for the first time since I left Europe. The experience was quite nice because the woman who washed and cut my hair was really nice and she even gave me a head and shoulders massage for free!! 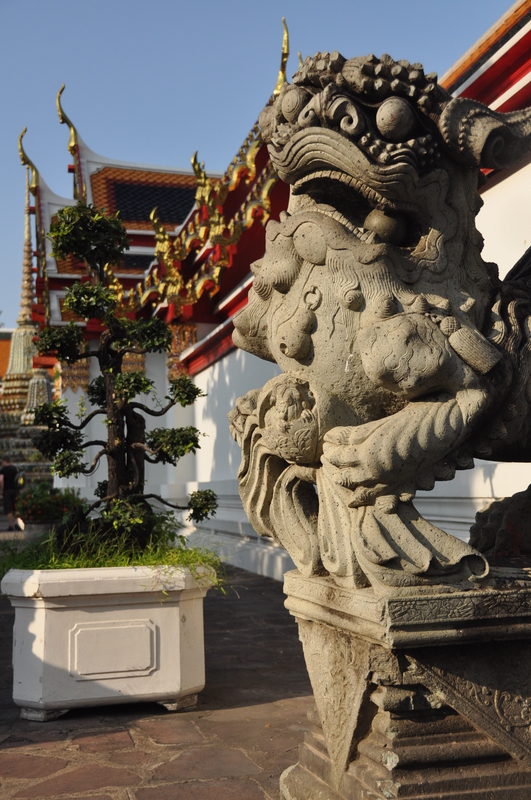 In the afternoon, we visited Wat Pho, the temple which is home to the famous Reclining Buddha, one of the most famed sights of Bangkok. 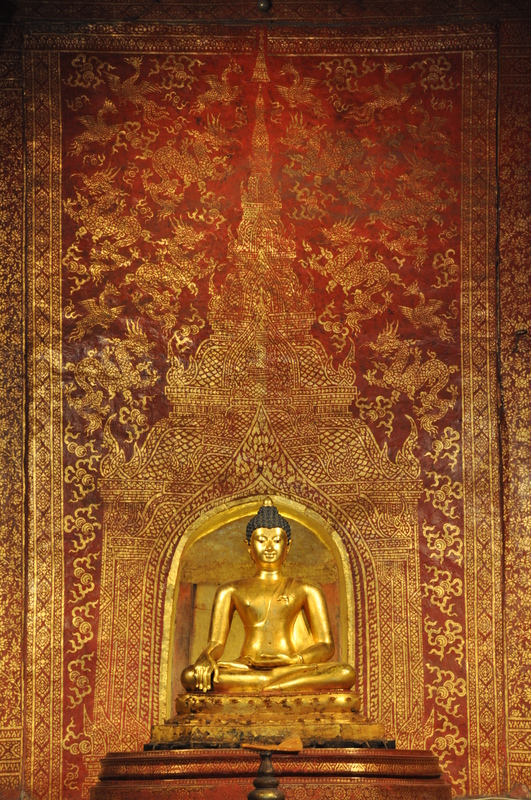 This serene golden Buddha is really huge (46 meters long by 15 meters high) and it is located in a beautiful complex of temples with colourful green, red and yellow small glass decorations. 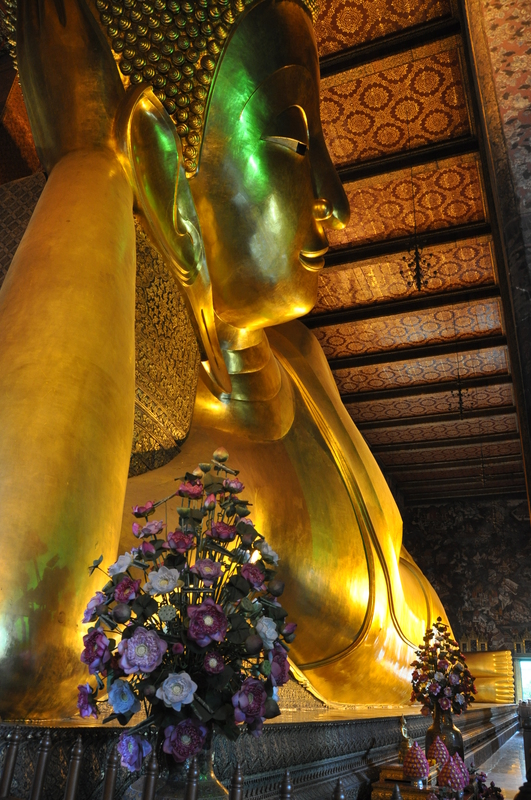 The best part of it all, in our opinion, are the Buddha feet, which apart of being also of colossal size (3 meters high! 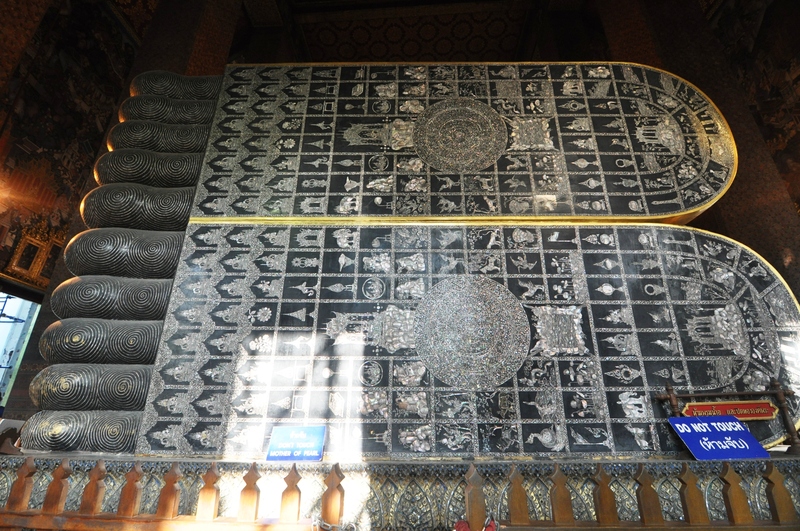 ), are decorated with different images of Buddhist symbols made with pearl incrustations. After spending a month in Laos and Cambodia, we came back to Bangkok the morning of the 15th of January in order to meet our friends Alicia and Gonzalo, whom will join us for our next destination: Myanmar. We travelled through the night from Siem Reap (in Cambodia), to Bangkok. Despite all the reports about touts, problems at the border, etc, that we had read and heard, the trip was really smooth and we did not have any problem. At the border, the officials stamped our passports and we got onto a ban on the other side. 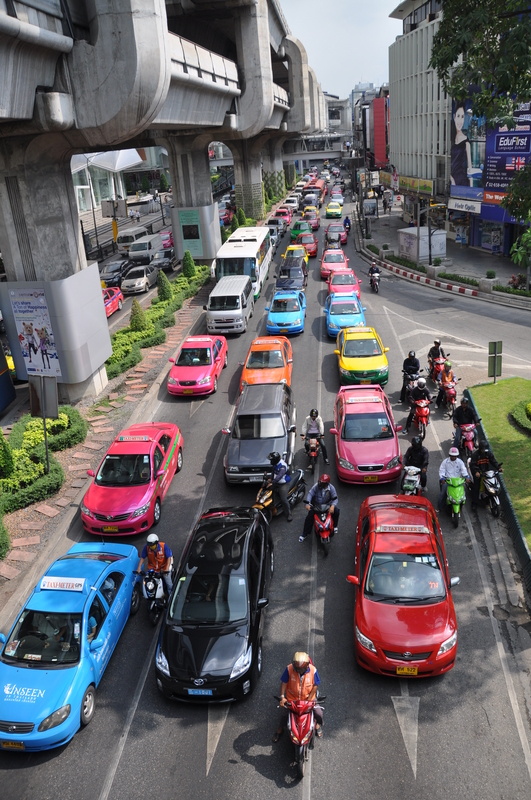 Once in Bangkok, it helped that we had already been in town, since we were able to tell the driver of the ban where we wanted to be dropped off. We were really excited to meet Ali and Gonzalo. It is not only that they are really good friends, but also, they were the first close friends whom we had met since we left home, more than two months back. We had agreed on meeting directly in the guesthouse, and according to the plan, Ali and Gonzalo would arrive very early in the morning and they will wait for us there. When we opened the outer door of the small guesthouse, the first thing we saw was Gonzalo!! We were so excited!! Meeting really close friends whom you have not seen for a while in a completely different country is a really cool experience! We run towards him and started hugging-jumping the three of us together. Ali looked through the window and said hello and in a minute we were also greeting her on the cosy courtyard of the guesthouse. It was really hot and humid in Bangkok (actually, the hottest so far for us), and after a shower we all went to have some fresh smoothies and some food. 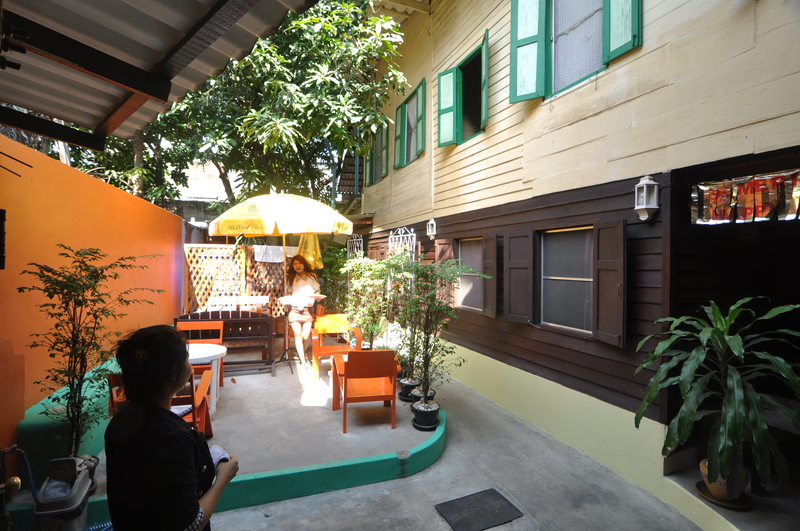 Our guesthouse, called Bangkok House Guesthouse, which I had found on the internet, was located in a real Thai neighbourhood and we all really liked it. It was less than 5 minutes from Khao San Road, but far enough to be quiet during the night, something that you appreciate after a few months in Asia. 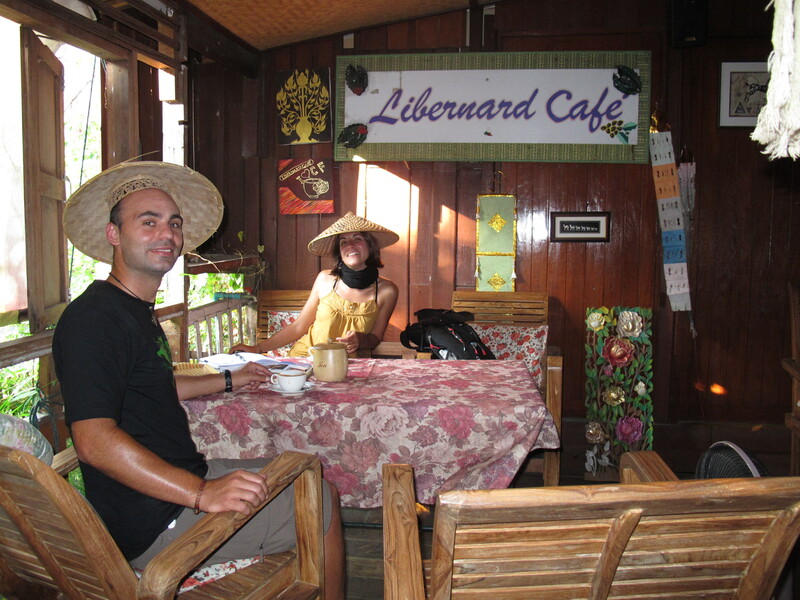 Once in Khao San Road, we introduced to Ali and Gonzalo the tasty Thai fruit shakes, and they also loved them!! 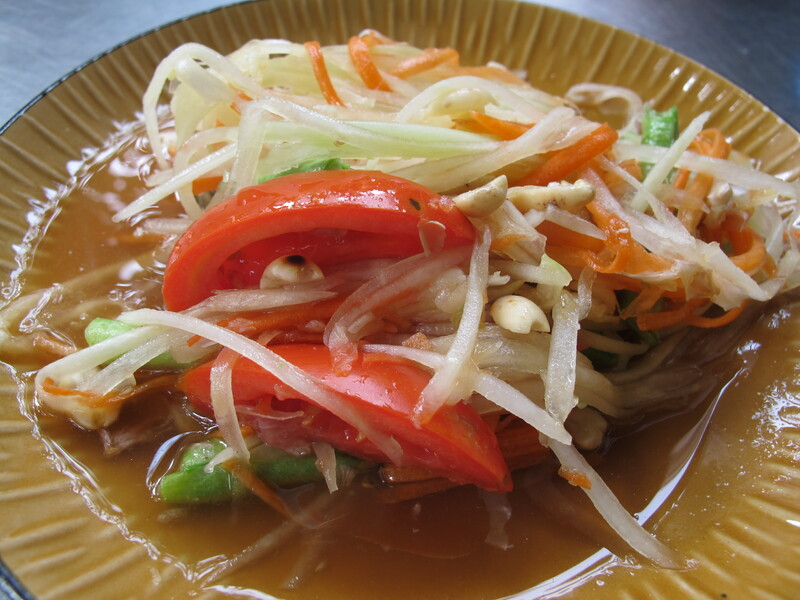 Then we went to have some food, such as spring rolls, papaya salad, green curry and fried (Chinese) vegetables in oyster sauce. After lunch, we wanted to do some sightseeing and just for the fun of it, we wanted to try a tuk-tuk ride all together. We were already familiar with tuk-tuks, as we had taken them in many Asian countries during our trip, but for Ali and Gonzalo it was a new experience and they wanted to ride one. We negotiated a very cheap deal with one of the drivers and we were having so much fun, that we did not notice that we were been victims of a typical rip off until it was too late. The tuk-tuk driver said that he would drive to a tailor shop first, and that we just had to pretend that we wanted to buy something there. Then they would give him some coupons that he could exchange for gasoline and he would take us to our destination. Of course that was not true. When we arrived to the tailor shop, the staff there looked like a real mafia, and of course we did not look like potential buyers at all. Gonzalo was nice enough to even try a suit, and Alicia and I could not help start laughing very loud as he looked very comical. The boss (or should I say “capo”) of the shop did not think that it was funny at all, and nearly kicked us out of the shop. The tuk-tuk driver was not happy either and he said that we had not tried enough. His intention was bringing us to one tailor shop after another until we eventually bought something or got tired and left. However, we realized that the whole thing was a rip off and left there. For us it was just an anecdote and we even had fun, but for people with limited time during their holidays, I can imagine that it can ruin their day. So be aware, this is a very typical rip off in Bangkok! When the tuk-tuk left, we did not really know where we were, and it took a while to get oriented. But luckily, we were not so far from Khao San Road, so we could easily walk “home”. 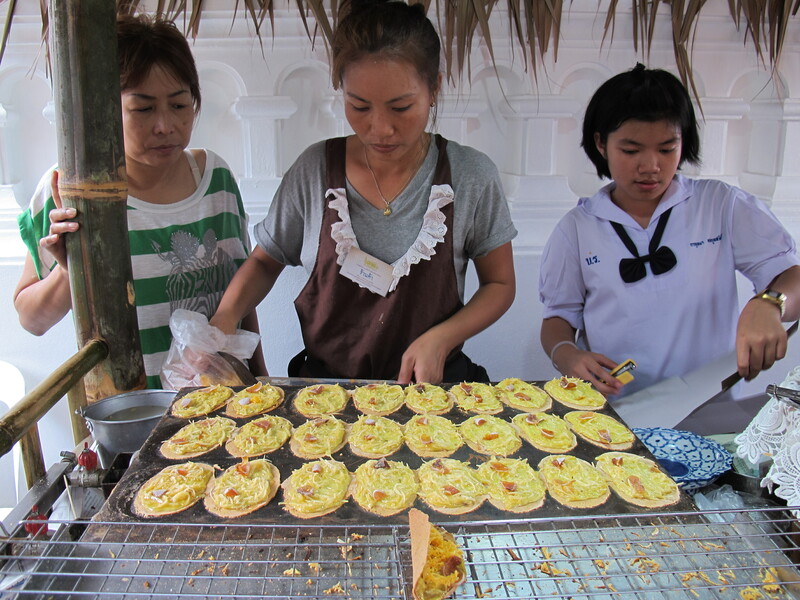 On our way, we found a temple with attached food stalls and we spent a while walking around and buying some snacks, all of them beautifully prepared and delicious as Thai food always is! Once in Khao San Road, and after buying some breakfast for the day after in a supermarket, Ali, Gonzalo and I went to get a feet massage, while Iván decided to go back to the hotel, as he was really tired. We found a nice looking place to get our massage done. We had already spotted in the afternoon and we really liked the place! It was located on a parallel street to Khao San Road and the massages were given directly on the street, so you could enjoy the massage and still see the life passing through your eyes. Besides, the people getting the massages there seemed all quite happy and relaxed. And best of all, an hour long massage cost only 300 bath (around 6-7 euro)! Ali, Gonzalo and I got a nice masseur each who seat us next to each other on a reclining chair on the street. They first washed our feet in warm water and aromatic herbs and then proceed to start the massage. Well, the whole experience was amazing and we really liked it and enjoyed it! Ali could not stop smiling and saying that the massage was going to be one of the highlights of their trip! 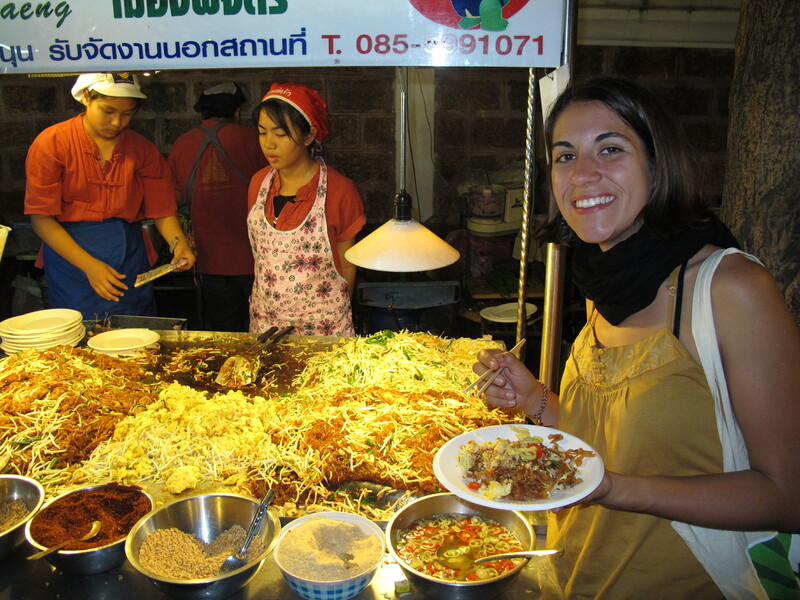 To top it all, the three of us had delicious “pad-thai” from a street vendor, before we headed to the hotel, as the day after was going to be tough. The 16th of January we all had a goal: getting our visas to Myanmar from the Myanmar Embassy in Bangkok. In order to be in the embassy before they opened and to start queuing, we woke up quite early and took a ferry to go South of the city. We really enjoyed the ferry ride and specially the sound of the whistle of the boat attendant, which resembled classical music, every time the ferry approached a stop. We managed to get to the Myanmar Embassy without getting lost, but there were already many people queuing when we get there (approx. at 8 a.m.), which discouraged us a little. Ali and I went to a photocopy shop nearby, which helps with proceeding all the necessary papers for the visa before the embassy opens, and we got everything ready in less than 10 minutes. All what was left was waiting. When they opened the embassy, we waited our turn to get a number, an then we waited again to deliver all the documents. After only a couple of hours in total, we succeeded in our “Burmese Mission”, our visas applications were accepted and we would just have to wait until 3 p.m. to pick them up. 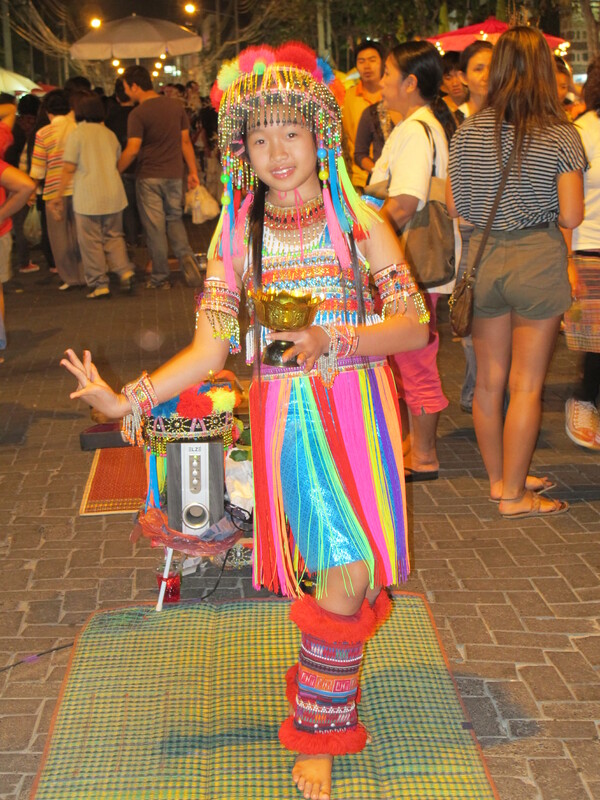 While we waited, we decided to go to Siam Square, the commercial district of Bangkok, which we had not visited yet. Well, since Alicia, Gonzalo and I are not fun of big shopping malls, we did not like the area so much, but Iván enjoyed them like a baby (Spanish saying) and we went for a walk in the neighbouring university area instead. After picking up our Myanmar visas (including extra queuing and waiting), we were ready to try one of the highlights of the day: going up to an open-air rooftop cocktail bar in a skyscraper! This is something which none of us had tried and we were really excited. However, until last minute we did not know if it would be possible because our clothes were not the right ones (apparently, there is an strict dress code to go to these bars). However, Gonzalo and Iván could borrow black pants and shoes from the hotel’s reception and for Ali and for me it was ok to come as we were. So, cool! We took the elevator and we went up to the 61st floor!!!!!!!! The place was called Vertigo and there was not much doubt why!! It was an incredibly open roof with a 360 view with nearly no fence, handrail or whatsoever!! The view was stunning and the whole city spread to our feet. We got ourselves some drinks which, although they were expensive made an even more wonderful stay. We enjoyed a sunset like very few we had seen before. After this, and when we where replaced at the bar by the Tai “high class” we headed to China town. This is definitely one of to places to visit in the city and probably one the liveliest. Indeed, by the time we were there the Chinese New Year celebration went on and the whole neighbourhood was highly decorated with all kind of reddish hangings and colourful lights that made a delightful atmosphere. As in any other Chinese location everything is pretty much related to food so we decided to try one of the specialties in the area, the curry crab. And wo!! It was good!! We had a wonderful dinner and a perfect end for such an intense day in Bangok. And that was basically our two stays in Bangkok. In the next post we will talk about Myanmar and how to almost lose your flight and survived the stress! I still do not believe we made it!!! We know, we know…it has been a long time since we wrote our last post, but since we started our trip around South East Asia, everything has gone so fast that we have barely haft time to write. Ok, so where were we? Oh, yes, Thailand. 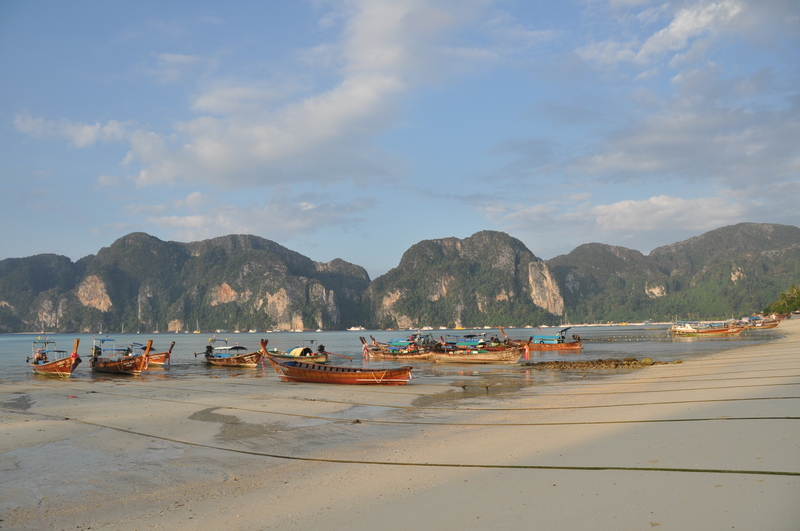 In the last post we told you about our brief trip to Phi Phi Island. 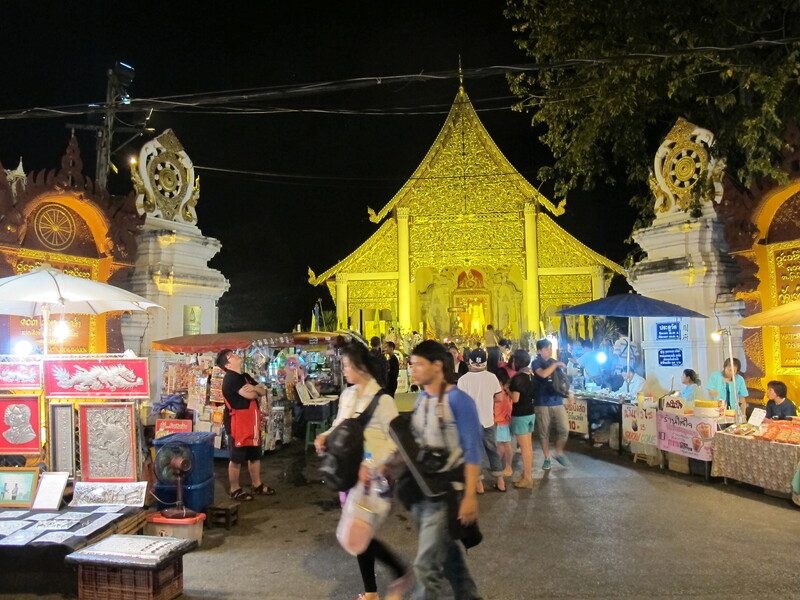 After that, we took a night train to Bangkok, we spent the following day visiting Bangkok and the following night travelling towards the North of the country, to the city of Chiang Mai. 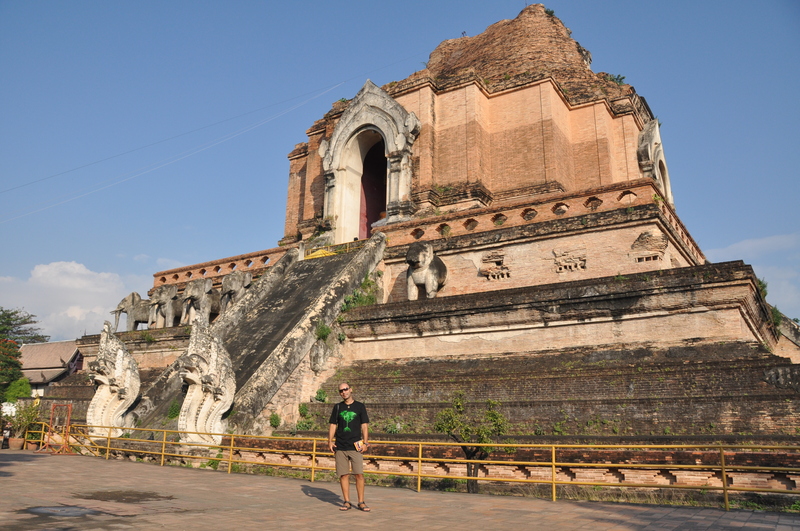 After a long, but really comfortable trip in the sleeper train, we arrived to a sunny Chiang Mai around midday. We walked inside the city walls to Diva guesthouse, a really cosy accommodation option with friendly owners and really good location. After a shower and a good rest, we started exploring the city. 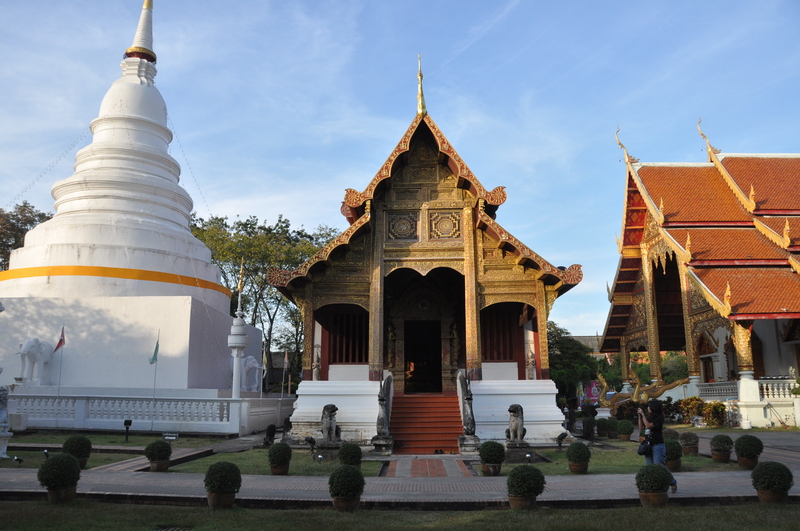 We loved Chiang Mai since the very first moment. It was a combination of very friendly people, delicious food, beautiful old temples and gorgeous nature. We spent three days there, but we could have easily been there for a week! We were so lucky to be there on a Friday, on a Saturday and on a Sunday. 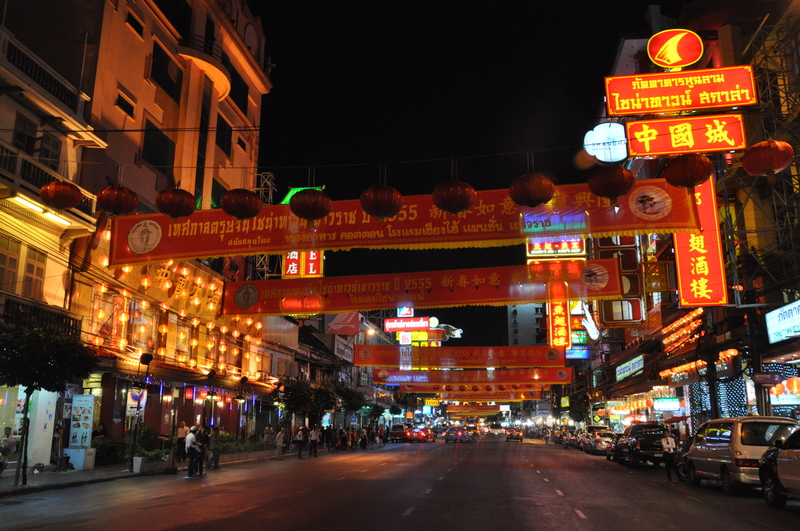 This meant that we could see and experience the three different night markets of the city: the Night Bazaar, the Saturday Walking Street and the Sunday Walking Street. 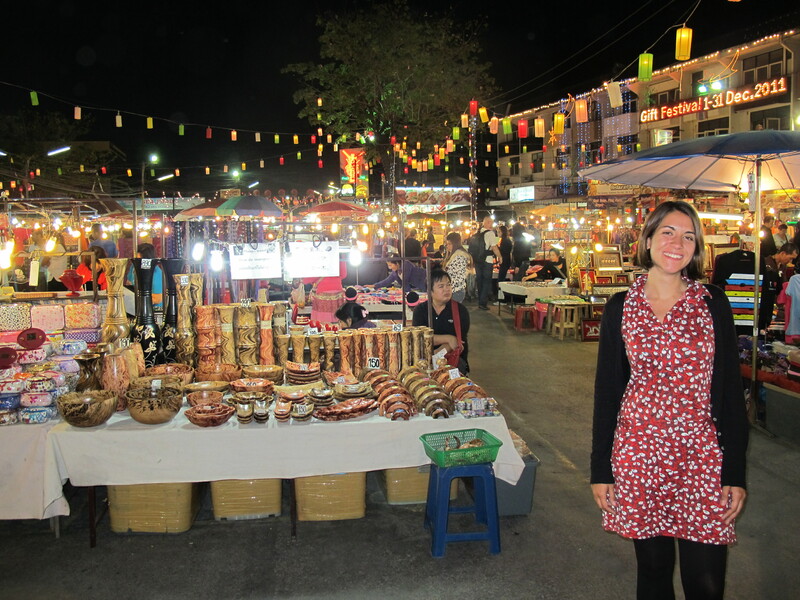 These fascinating markets are all an authentic paradise for foodies and handicraft lovers! In the markets that we had visited before, the stalls sold basically the same products, or at least similar souvenirs. 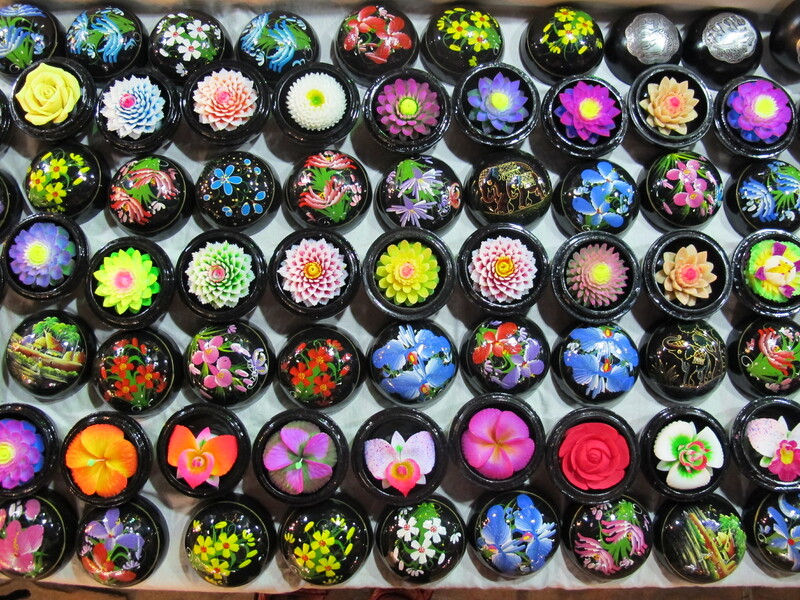 The markets in Chiang Mai, however, are so special because of the diversity of products on sale: from hand-carved soaps with the shape of flowers or animals to glass blowers, many of the items being produced in situ by local craftsmen. 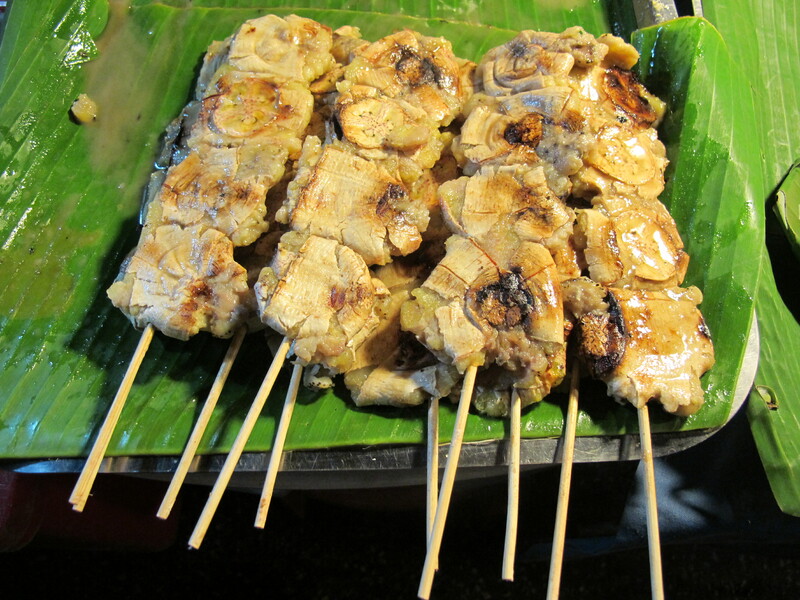 Besides that, hundreds of food vendors sell their delicacies in their food stalls, everybody selling even more delicious food than the one before! 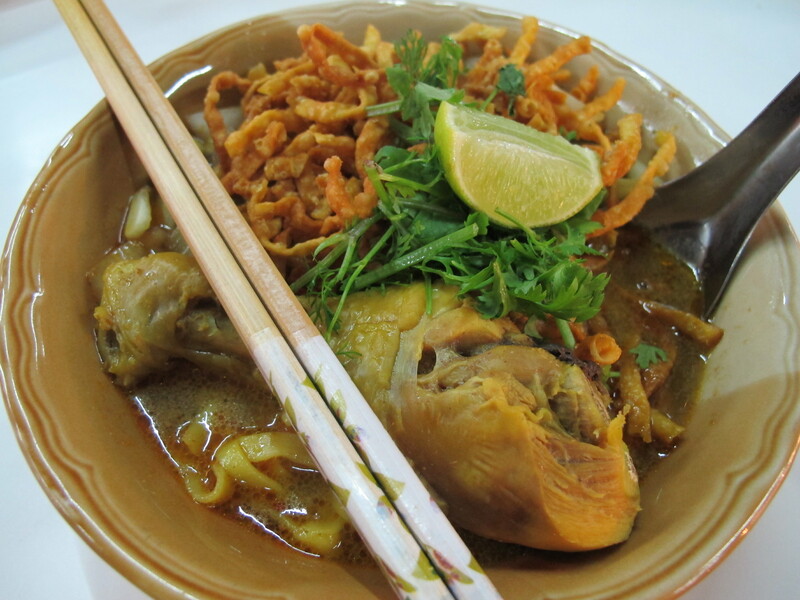 We tried everything: the local speciality (Khai Soi Kai noodle soup, see picture below), Chinese deep fried balls, barbecued chicken legs, spiral potato chips, sausages with potato mousse, pad thai, hand made noodles, sweet sticky rice with raisins, bananas in stick cooked in coconut sauce, waffles, Oreo milk shakes…the list is endless! 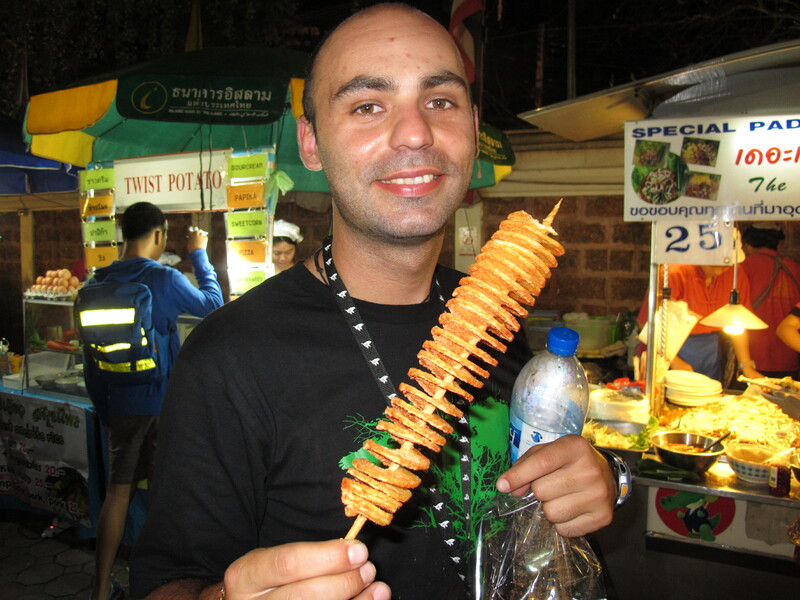 Thai chips on stick, so loved by Ivan! 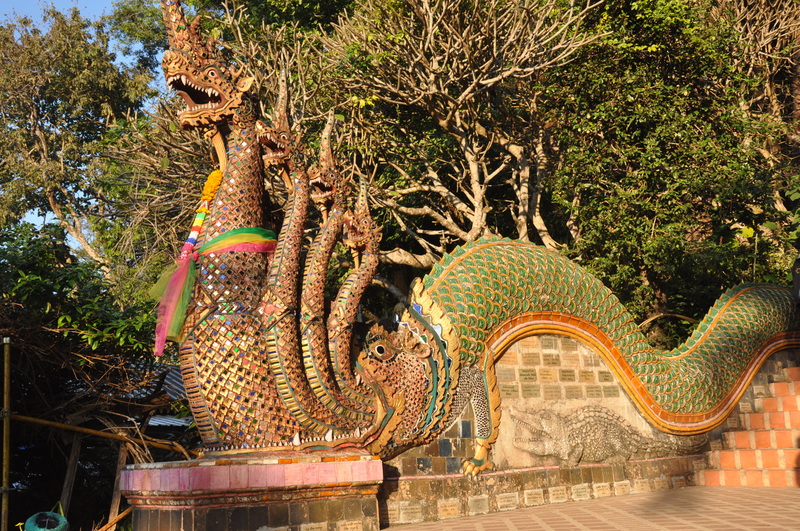 Below there is a list of the sights that we visited during our stay in Chiang Mai, including a visit to the zoo and an exciting motorbike trip in the surrounding countryside. 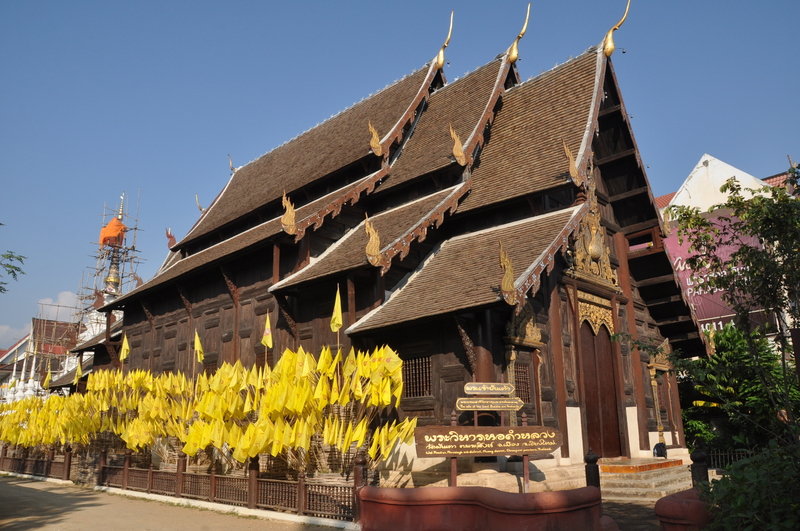 We have also included many pictures of these fantastic three days and we hope that they awaken your interest about visiting lovely Chiang Mai. – Night bazaar, Saturday Walking Street and Sunday Walking Street: each of them taking place in a different part (or street) of the city, there are all different and the atmosphere unique, even though many sellers are the same in all three markets. 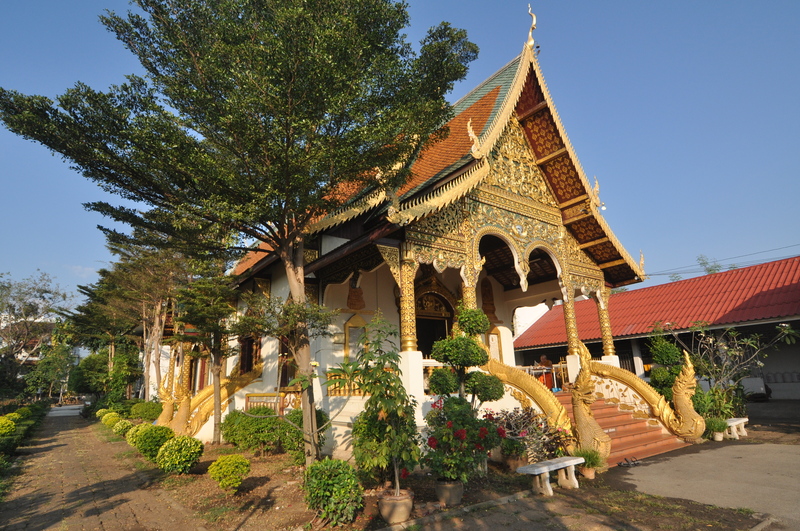 – Chiang Mai temples: Wat Phra Singh (including the famous Phra Singh image) and Wat Chedi Luang are the most famous ones, but there are plenty of other scattered around the city! – Chiang Mai zoo: a place where Thai families come on weekends, interesting to see the pandas, koalas, orangutans and gibbons. 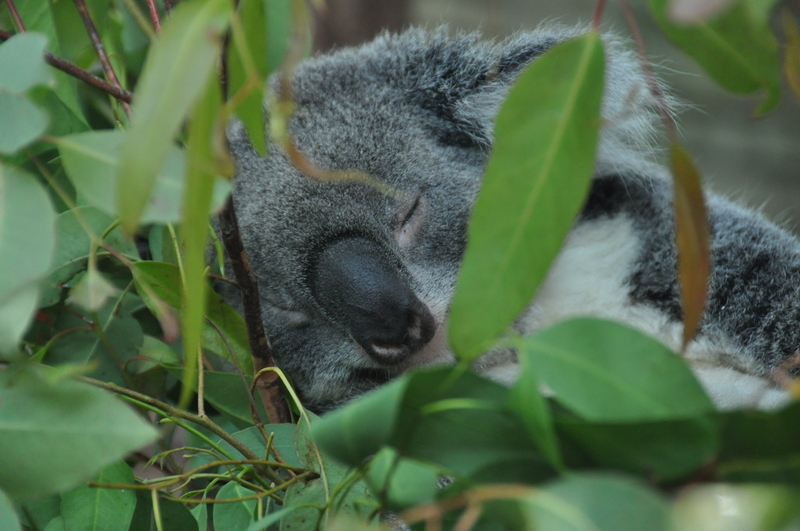 Moreover, there is a new aquarium and a huge aviary, but we didn’t have time for those. 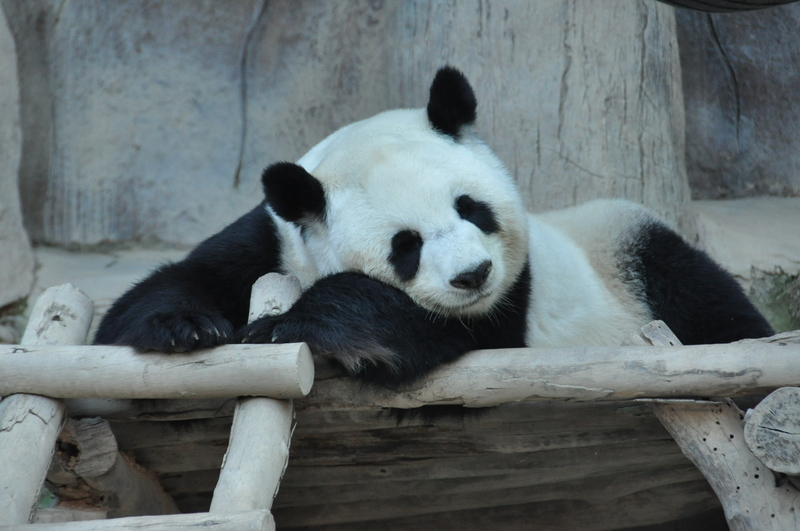 Panda Bear at Chiang Mai Zoo. 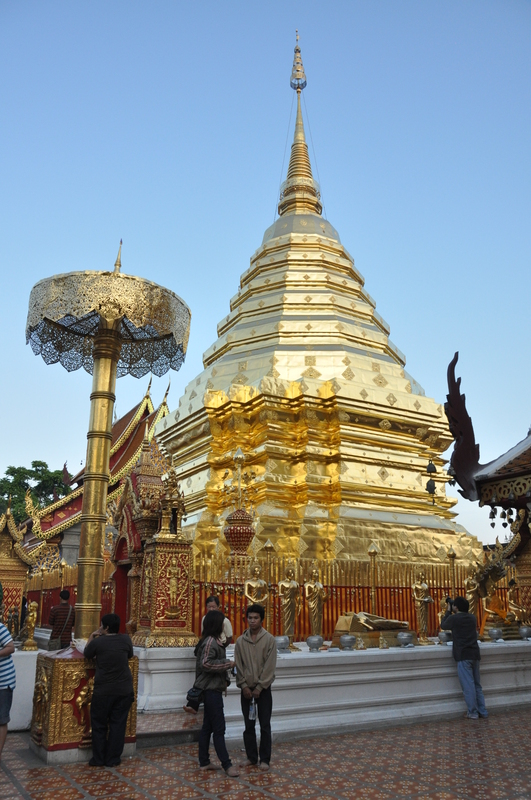 – Wat Phrathat Doi Suthep: spectacular temple located on the top of the Suthep hill. 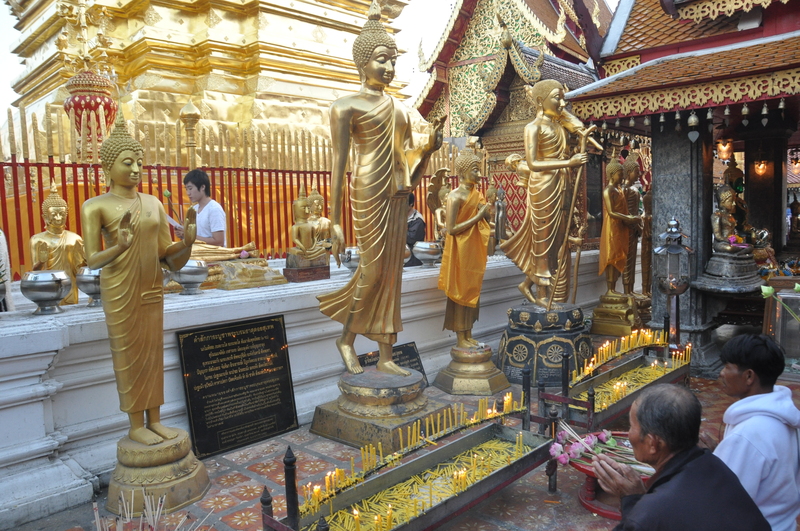 The temple is very beautiful itself, but the most interesting thing is to see the pilgrims coming here to make offerings of lotus flowers and of oil for the butter lamps. 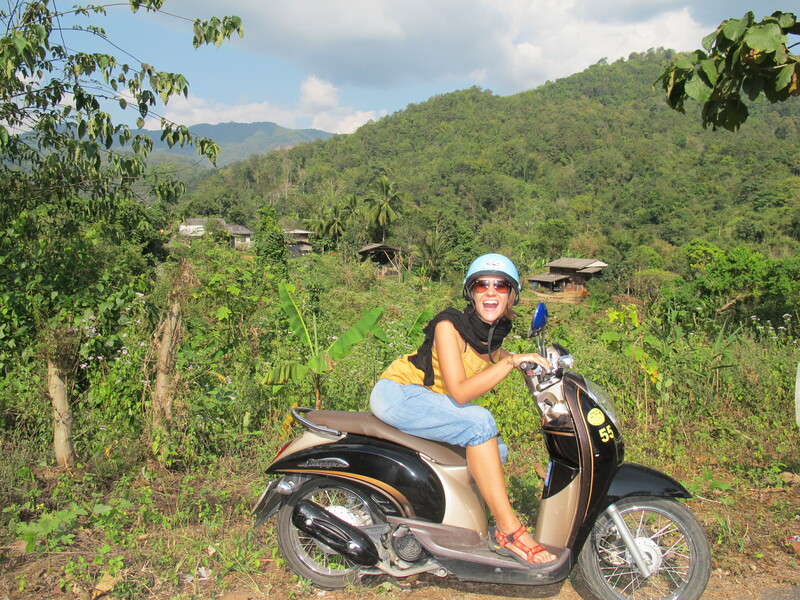 – Motorbike trip in the Mae Sa Valley: the Mae Hong Son Loop: we did the short version and it took us around 5 hours including a visit to a waterfall and the lunch break. This is a popular trip to do on weekends and we saw many people doing it by bike. There are plenty of things you can do on the way, such as elephant camps, orchid gardens, etc and there is a longer version for which you need two days to complete. After having spent around five weeks in the mountains and having been really cold sometimes, we were looking forward to head to the warmer South East Asia. 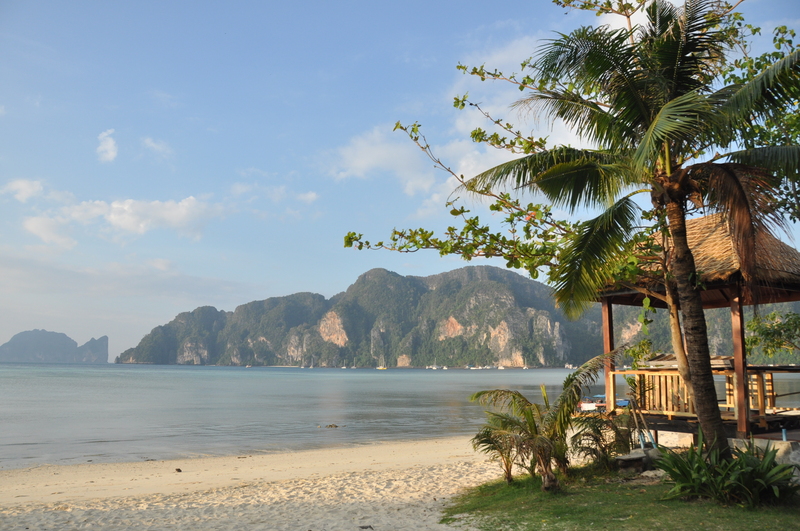 Although it wasn’t in our original itinerary, we just felt like going to the beach, and what place can beat the Thai beaches? We knew that it would be crowded, but we just wanted to check out what seemed to be one of the most beautiful beaches in the country and a place that we remembered, our good friend “Doctor Arana” (congrats with the PhD!!) had recommended us a while ago. 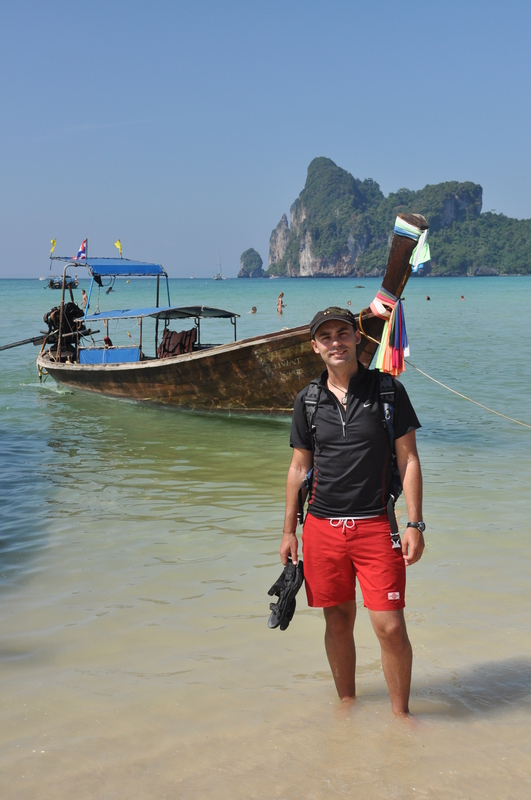 So without hesitation, we took a train, a bus and a boat and after 16 hours we were in Ko Phi Phi, or Phi Phi islands. We arrived after a long trip and we were tired to start finding accommodation, so after an hour of wandering around, we found a really nice Spanish/Australian couple who recommended us the place where they were staying. It wasn’t in the town side, but a bit further away, close to an area called Long Beach, and we were happy to escape from the party animals that seemed to have conquered the town. Despite our perception, it seemed that the island was not at its maximum capacity, as luckily for us, everybody had gone to the full moon party in one of the nearby islands. 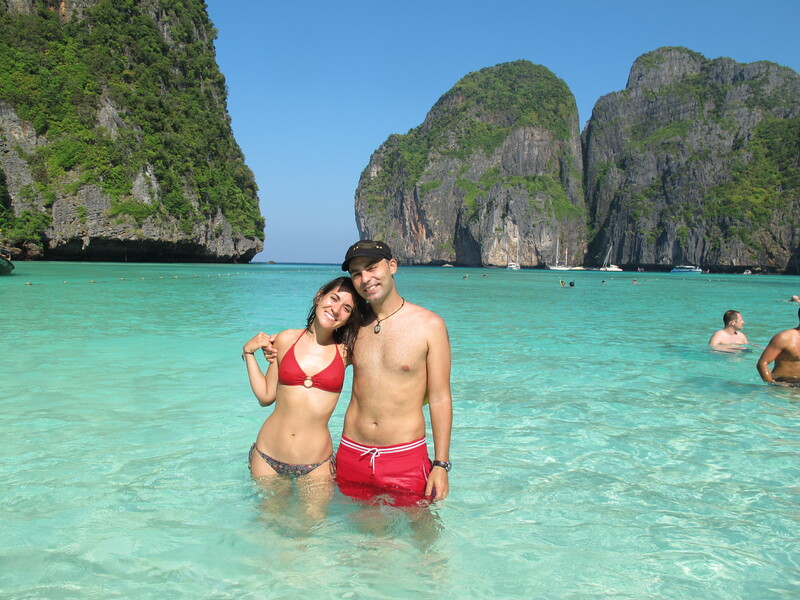 So we were so lucky to be able to enjoy the paradise of Ko Phi Phi without the crowds, yupi!! We got a simple, but nice bamboo bungalow right in front of the sea, with a hammock in the front, and the resort itself was really beautiful, built in traditional thai style and with multiple nice touches. We loved the restaurant, placed in front of a small beach, from where you could seat and watch the sunset while sipping a Chang (local beer). The prices were not as high as in the big resorts, but we were at the edge of our budget, so we thought that despite the beauty of the place, it was wise to stick to three days in the island, in order to save our pockets ;o) Funny enough, the resort in which we ended up, the one recommended to us by the nice couple, was called Viking Resort, so we couldn’t escape the Danish influences, even so far away! The following morning, we were shocked by the beauty of the place! The water was of an incredible turquoise colour and karts hills grew from the water in the distance. Colourful fishes swam around us without even noticing us and just a few meters from the shore, there were coral formations hosting all kind of marine creatures, including non dangerous back-tipped sharks. We thought about all our friends who would enjoy this place! How much we missed you all!! We thought a lot about Charly, who loves these kind of places so much! Still, we agreed, this beach cannot beat Maria La Gorda in Cuba, so don’t worry Charly, we still haven’t found a beach which could overcome La Gorda’s beauty!! We spent the morning in the incredible pretty Long Beach, which was unusually quiet, only a few people in the sand and swimming, we almost had the beach only for us! We rented a couple of goggles and tubes and we snorkelled all morning and part of the afternoon. 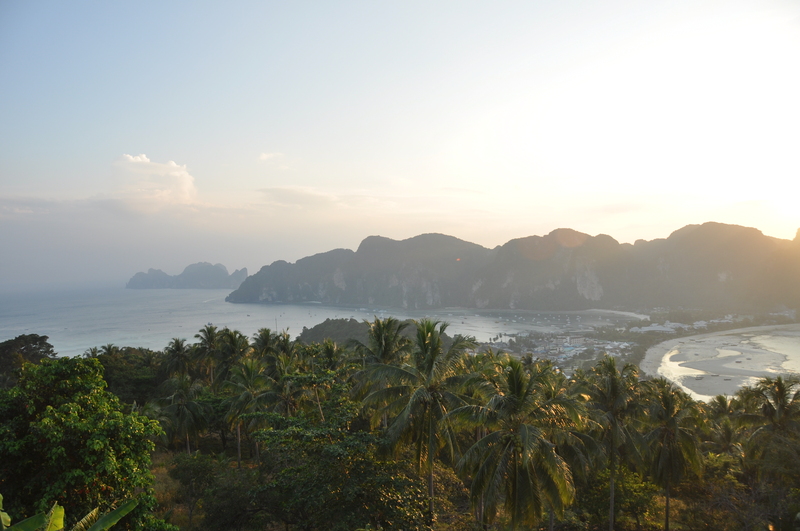 Then we head to town, where we wanted to book a snorkelling trip for the day after in the renowned Ko Phi Phi Ley, and after enjoying a nice Thai meal, we visited the more crowded, but still beautiful beach of Ao Lo Dalam and we went up to the view point to see the sunset. There we were welcomed by a troop of mosquitoes who took well care of our legs and feet (as usual, Sonsoles got the best piece of the cake). The next day we got up early and hiked to town along the beach. We met our companions (two girls from Italian Tirol and two ladies from Denmark!! 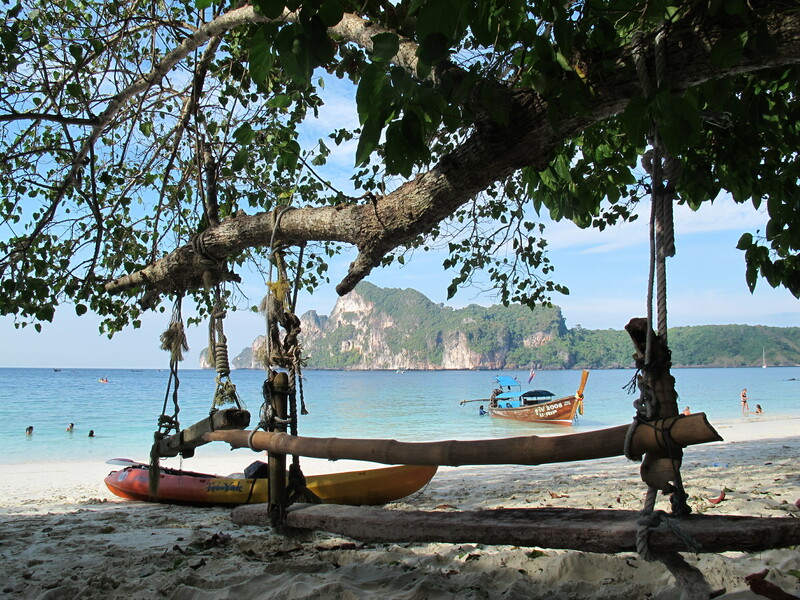 ), put our wet suits on and head to Ko Phi Phi Ley. There, we were amazed by the beauty of the island and any words we could use would not be enough. 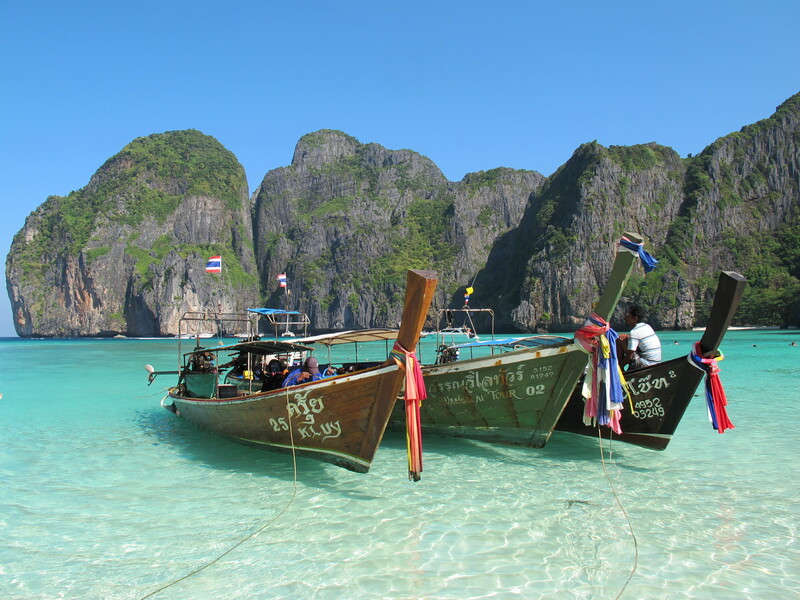 The blue lagoon, the world-wide famous Maya Bay (the beautiful beach where Di Caprio’s movie was shot, although quite crowed too) are just breathtaking and as wonderful as you always imagined. 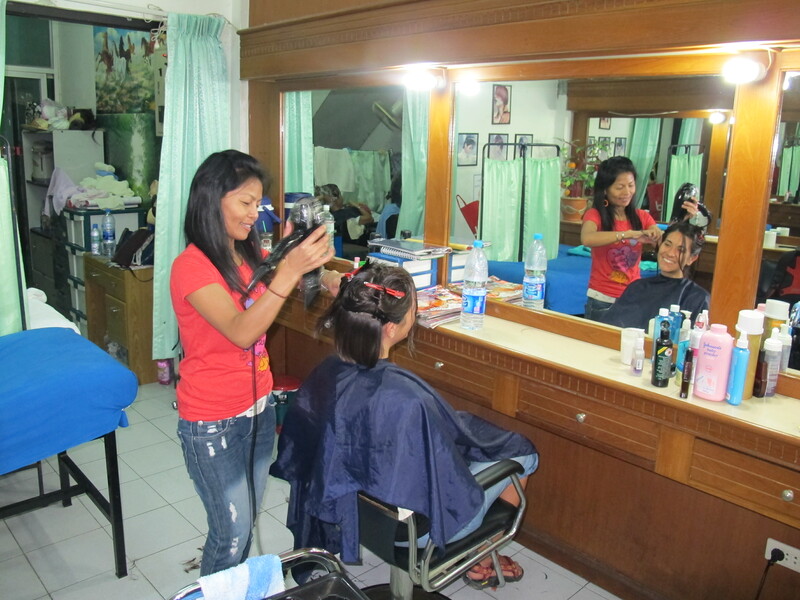 Just check out the pictures!! Then we continued snorkelling for another hour and come back to the main island. We saw endless colourful fishes, including the little Nemo in its anemone, small sharks and Iván even spotted a turtle. To finish the day we fletched a long tail boat to the equally great Monkey Beach (which is rather easy to access just on a kayak by the way) and enjoyed it a lot too. There is great snorkelling here plus the fun of the naughty monkeys!! Sonsoles posing at Monkey Beach. 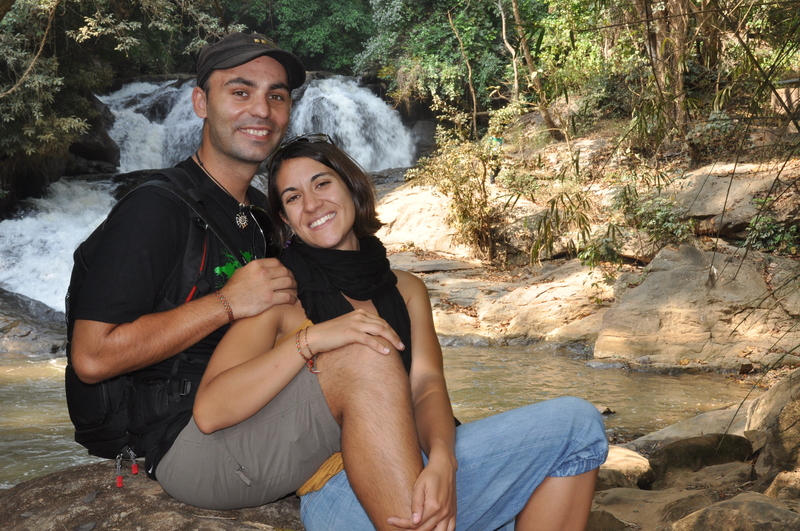 We are Iván and Sonsoles, a Spanish couple of environmental scientists. Since 2004 we live in Copenhagen, where we work as process engineers with water treatment. In November we will start our five months trip to Asia and this blog will be the platform which will allow us to tell you our adventures. Welcome to our blog! Welcome to Indonesia, the country of diversity!